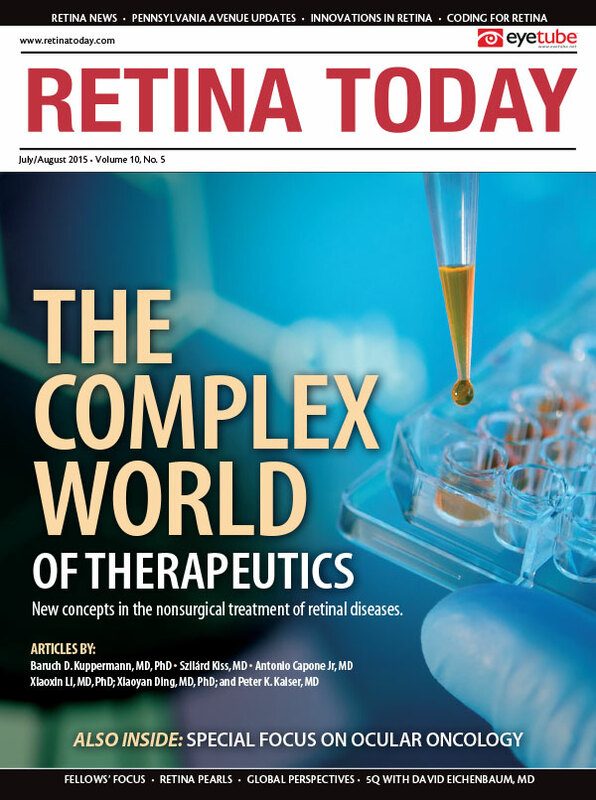 Recent findings support the combination of pharmacologic and laser therapies for retinal diseases. • Although pharmacologic therapy provides excellent results in the treatment of diabetic macular edema, roughly half of patients will require supplemental laser. • Because it does not cause collateral damage in the retina, subthreshold laser therapy may produce better visual acuity results than conventional laser. • Laser therapy remains the primary therapy for patients with remote macular edema. The number of available options for treating diseases of the posterior segment continues to grow, and the technologies behind these options are ever changing and improving. It is only natural, then, to question whether any of the old options and technologies will eventually fall by the wayside. As far as the use of lasers goes, it is here to stay—at least for the foreseeable future. The role of lasers in the treatment of diabetic macular edema (DME) alone is proof enough. DME is one of the major causes of significant visual acuity loss in working-age adults and is the most common cause of visual acuity loss from diabetic retinopathy. For years, the standard therapy was focal laser photocoagulation, but the tide has changed, and many surgeons now begin treatment with intravitreal injection of a pharmacologic agent. Recent studies have shown that monotherapy with intraocular injections of anti-VEGF agents has the potential to stop the deterioration of vision in patients with DME and even reverse it.1,2 This approach, however, requires multiple and frequent treatments. Furthermore, after the effect of the medication wears off, the leakage recurs and macular edema returns. Subthreshold laser therapy has the potential to reduce DME with better visual acuity results compared with conventional laser, as it does not cause collateral damage in the retina.6 Indeed, subthreshold laser uses low energy and causes no scars or permanent damage to the retina. As a result, visual acuity may stop declining or even improve. In the DRCR.net Protocol I study, the use of anti-VEGF therapy plus deferred laser resulted in visual acuity similar to that achieved with anti-VEGF therapy plus immediate laser.10-13 As a result, the consensus among retina specialists is that most patients with center-involving macular edema (the typical patients who were included in these trials) do not require laser up front. In patients with more remote macular edema, the use of laser therapy limited to the edematous areas is still common as primary therapy. Steroids are also a potential treatment for patients who do not respond to anti-VEGF therapy after multiple injections or who had a recent severe cardiovascular ischemic event. Keep in mind that, in patients in whom anti-VEGF therapy did not completely reverse the disease, adding laser may still be beneficial. In fact, results from the recently published Protocol T study support this claim.14 In Protocol T, 660 patients with center-involving DME were randomly assigned to monthly intraocular injections of one of three anti-VEGF drugs: 1.25-mg bevacizumab (Avastin, Genentech), 0.3-mg ranibizumab (Lucentis, Genentech), or 2.0-mg aflibercept (Eylea, Regeneron). After 24 weeks, researchers withheld injections if the edema was not resolved and if visual acuity neither improved nor worsened after two consecutive injections. In such cases, the protocol instructed the treating physician to administer laser treatment and to resume the injections if visual acuity or retinal thickness worsened. Figure 1. A 44-year-old man with nonproliferative diabetic retinopathy in both eyes. The patient received laser treatments in June 2013 and August 2014. Fundus photograph (A), red-free photograph (B), and fluorescein angiography (C) of the right eye in June 2014. B-scans (D and E) and spectral-domain optical coherence tomography maps (insets) of the right eye at treatment and follow-up visits. Figure 2. Corresponding images and scans of the left eye of the same patient as in Figure 1. At the 1-year follow-up visit, data in all three arms indicated visual acuity improvements. There were no differences among treatments in patients starting the trial with visual acuities between 20/32 and 20/40.14 Interestingly, this study found that in all three groups, a substantial number of patients (56% for bevacizumab, 46% for ranibizumab, and 37% for aflibercept) needed laser rescue after 24 weeks.14 In these patients, the beneficial effects of the anti-VEGF drugs reached a plateau, and vision-threatening edema remained, necessitating additional therapy in the form of laser rescue (Figures 1 and 2). Pharmacologic therapy provides excellent results in the treatment of DME. However, nearly half of patients need supplemental laser after several months of monthly intraocular injections. In collaboration with my colleagues Michaella Goldstein, MD, and Dafna Goldenberg, MD, I have had an excellent experience using a subthreshold laser prototype to treat patients with extrafoveal DME. Because of the location of the edema, the visual acuity loss that resulted was not significant, so we did not expect significant changes in visual acuity. Surprisingly, these patients showed significant reductions in edema and retinal thickness.6 Regarding safety, this treatment did not leave scars or permanent retinal damage. Taking these findings into consideration along with the clinical trial results discussed above, it seems clear that laser still has a place in the treatment of DME. Anat Loewenstein, MD, is a professor and the director of the department of ophthalmology at Tel Aviv Sourasky Medical Center and vice dean of the Sackler Faculty of Medicine at the Tel Aviv University. She is a consultant to Lumenis. Dr. Loewenstein may be reached at anatl@tlvmc.gov.il. 1. Varma R, Bressler NM, Doan QV, et al. Visual impairment and blindness avoided with ranibizumab in Hispanic and non-Hispanic whites with diabetic macular edema in the United States. Ophthalmology. 2015;122(5):982-989. 2. Bressler NM, Varma R, Suñer IJ, et al; RIDE and RISE Research Groups. Vision-related function after ranibizumab for diabetic macular edema: results from RIDE and RISE. Ophthalmology. 2014;121(12):2461-2472. 3. Berger A, Sheidow T, Cruess AF, et al. Efficacy/safety of ranibizumab monotherapy or with laser versus laser monotherapy in DME. Can J Ophthalmol. 2015;50(3):209-216. 4. Ishibashi T, Li X, Koh A, et al; REVEAL Study Group. The REVEAL Study: ranibizumab monotherapy or combined with laser versus laser monotherapy in Asian patients with diabetic macular edema. [published online ahead of print May 13, 2015]. Ophthalmology. doi:10.1016/j.ophtha.2015.02.006. 5. Chen G, Li W, Tzekov R, et al. Ranibizumab monotherapy or combined with laser versus laser monotherapy for diabetic macular edema: a meta-analysis of randomized controlled trials. PLoS One. 2014;9(12):e115797. 6. Soiberman U, Goldstein M, Pianka P, et al. Preservation of the photoreceptor layer following subthreshold laser treatment for diabetic macular edema as demonstrated by SD-OCT. Invest Ophthalmol Vis Sci. 2015;55(5):3054-9. 7. Nguyen QD, Brown DM, Marcus DM, et al; RISE and RIDE Research Group. Ranibizumab for diabetic macular edema: results from 2 phase III randomized trials: RISE and RIDE. Ophthalmology. 2012;119(4):789-801. 8. Mitchell P, Bandello F, Schmidt-Erfurth U, et al; RESTORE study group. The RESTORE study: Ranibizumab monotherapy or combined with laser versus laser monotherapy for diabetic macular edema. Ophthalmology. 2011;118(4):615-625. 9. Nguyen QD, Shah SM, Heier JS, et al. Primary end point (six months) results of the ranibizumab for edema of the macula in diabetes (READ-2) study. Ophthalmology. 2009;116(11):2175-2181. 10. Elman MJ, Aiello LP, Beck RW, et al. Randomized trial evaluating ranibizumab plus prompt or deferred laser or triamcinolone plus prompt laser for diabetic macular edema. Ophthalmology. 2010;117(6):1064-1077. 11. Elman MJ, Bressler NM, Qin H, et al; Expanded 2-year follow-up of ranibizumab plus prompt or deferred laser or triamcinolone plus prompt laser for diabetic macular edema. Ophthalmology. 2011;118(4):609-614. 12. Elman MJ, Qin H, Aiello LP, et al. Intravitreal ranibizumab for diabetic macular edema with prompt versus deferred laser treatment: three-year randomized trial results. Ophthalmology. 2012;119(11):2312-2318. 13. Aiello LP, Beck RW, Bressler NM, et al. Rationale for the diabetic retinopathy clinical research network treatment protocol for center-involved diabetic macular edema. Ophthalmology. 2011;118(12):e5-14. 14. Wells J, Glassman A, Ayala A, et al. Aflibercept, bevacizumab or ranibizumab for diabetic macular edema. N Engl J Med. 2015;372(13):1193-1203.